Cape Town - Wolverhampton Wanderers captain Conor Coady has praised the impressive work boss Nuno Espirito Santo has done since taking charge of the club. 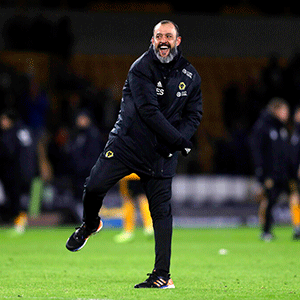 Portuguese tactician Nuno was appointed at Molineux in the summer of 2017 and led Wolves to the Championship title in his debut season, ending the Black Country outfit’s six-year absence from the Premier League. The West Midlands side has enjoyed a brilliant return to England’s top flight and they currently sit seventh in the standings, a position which could be good enough for a place in the qualifying rounds of the Europa League. Nuno is a contender for the Manager of the Year award and Coady, who has been an ever-present in the league this term, says the 45-year-old has done a sensational job. He told Radio 5 Live Breakfast: "We’re all enjoying it, over the last two years since the manager came in he’s really changed the direction of the club. "It was needed, his staff came in and they’ve been absolutely phenomenal, but in terms of the way the lads are playing it’s all down to him. "It’s important we keep on listening to him and keep on enjoying it and hopefully we can keep on getting better."